Build and grow your eSports team with epic website hosting. Start free! Host your own elimination and round robin tournaments! Then record your matches against other teams easily. Organize your events and tournaments from a single interface. Online signup sheets allow you to know which members will attend each of your events. Record your member statistics in highly customizable leaderboards and compare your members. Great for esport teams! Your website is your own social network, under your control. Our standard features include forums, activity feeds and member profiles. 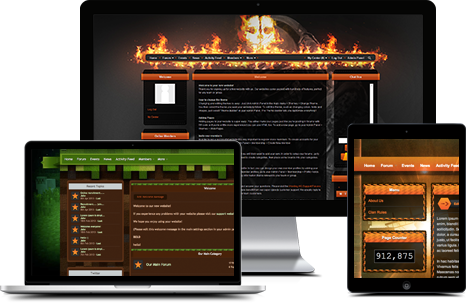 Choose one of our themes and the edit to your exact requirements. Your imagination is the limit. Run your entire website from our simplistic and minimalistic administration panel. No technical skills required.